The beauty of the Akron Children’s Hospital Holiday Tree Festival is often in the stories that inspire people to donate and decorate trees. For one local family, the care they received at Children’s touched them personally, inspired a career and motivated them to give back to the hospital that helped their premature baby boys thrive. On March 18, 2004 twins Jude and Mitchell Oliver arrived 3 months early, weighing just 2 lbs. each. During a near 2-month stay in the hospital’s neonatal intensive care unit (NICU), the boys’ experienced struggles, improvements and everything in between. The nurses and doctors became extended family, offering care, support and patience during an otherwise stressful time. Betty Thomas and her daughter Lezlie Thomas Oliver work on their tree, Rosso Natalé. Paying attention to every last detail, the nurses kept the family informed of the boys progress and successes around-the-clock. Proud grandmother, Betty Thomas, remembers fondly how a nurse heard one of the boys knocking one day. The boys’ cousin, Nicole Zimmerman, was a senior at Hoban High School during their stay at the NICU. She came to Children’s every day after school to visit her new cousins. She was planning to major in biomedical engineering after graduation, but was so fascinated and inspired by the staff at Children’s she switched her major to nursing. Today, you can still find Nicole at Akron Children’s but not as a visitor, rather as a NICU nurse practitioner. Giving back to the hospital that cared for the boys during their time of need has become a tradition and a way for the family to pay it forward. “Rosso Natalé,” Italian for “Red Christmas” features a radiant red tree with sparkling lights, peppermint swirl bulbs, striped stockings and snowflake accents. Every year the family decorates the tree with Italian-inspired colors and decorations which reflect Betty’s Italian heritage. This year’s “Rosso Natalé” meaning “Red Christmas” features a radiant red tree with sparkling lights, peppermint swirl bulbs, striped stockings and snowflake accents. As for Jude and Mitchell, the boys are now 11-years-old and happy, healthy 5th graders. Jude plays basketball and wants to one day become a pilot for a major airline while Mitchell, who has autism, is a musician and wants to someday write a musical or movie and become the next Tim Burton. 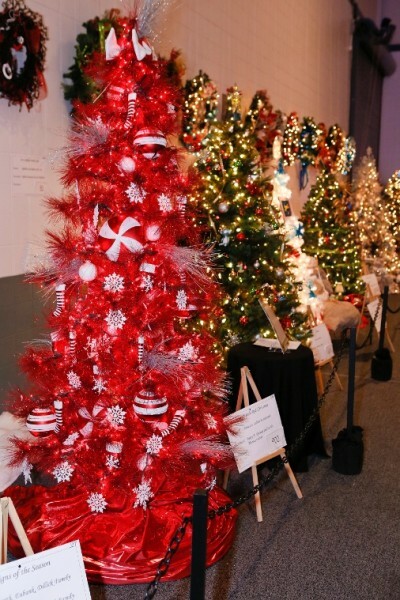 The Holiday Tree Festival is taking place now through Nov. 29 at the John S. Knight Center in Akron. Admission to the festival is free. Click here for more information.